Diagrams are included to help you understand particular rules in this section of the handbook. Some diagrams have plan (overhead) or ordered views of vehicles. Plan (overhead) views of roads and vehicles are used in many cases to illustrate rules. 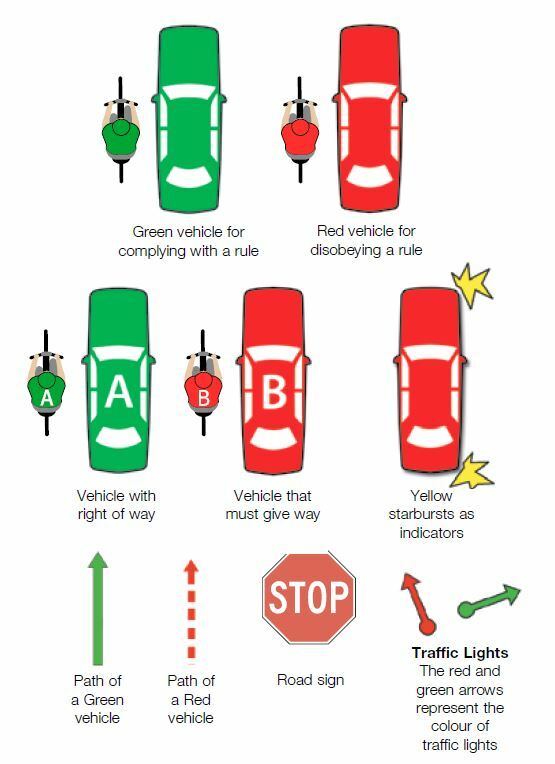 In some diagrams, a red vehicle shows where the driver is disobeying or breaking a rule. A green vehicle shows a driver who is obeying or complying with a rule. 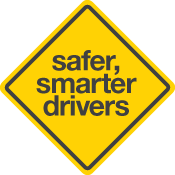 In others, a red vehicle shows where a driver must give way to pedestrians, bicycles or other vehicles. The red vehicle is marked with a letter 'B' on the roof while the other vehicle is green and marked with the letter 'A'. A solid green arrow shows the path of a green vehicle and a broken red arrow shows the path of a red vehicle. The yellow starbursts at the corners of the vehicles show flashing indicator lights. Short green and red arrows positioned off the road at intersections show the colour of the traffic lights as seen from that direction.